Use your own domain – for free! About a year ago, we started selling domain names and the ability to use your own domain names on Edublogs blogs. Well, after we did that for a while, we changed over to the Supporter model and that became tricky… but no longer, because we’ve decided to bundle free domain mapping in with Supporter, so that every single supporter can now use their own domain… at no extra charge! So, we did the very simple thing of going out and purchasing suewaters.com (for less than $10), and then configured the A record by following our handy Using Your Own Domain guide. And that’s all there was to it… now you can catch Sue Waters at… suewaters.com! As mentioned above, this is a new feature for Edublogs Supporters, at no extra cost, which we think is pretty darn cool. Sue was getting us to guess how her blog had changed – I was so used to it with the aquaculture URL, I didn’t even think to look to see if it had changed. I see though that you will have to give her more chocolate as she will now have to go and change all her links to her new URL or does domain mapping automatically know to go somewhere else? @kendowebproject Yes it does it automatically. Feel free to test it with my original Edublogs URL – http://aquaculturepda.edublogs.org If you click on that link it will automatically direct you to the new domain name. I not having much luck with this domain issue. I want to reset it. I can not pull up my blog now. I’ll like to keep the old one. How can I do that? My blog was sucapp.edublogs. @sucapp Looks like you have got http://sucapp.edublogs.org/ showing again? I am already an Edublog supporter. What do I need to do to change my domain name? @Jeanie You need to purchase and configure a domain name. Follow these instructions. I’m trying to make sure I’ve done this correctly. I want people to see my edublog when they type into my domain name (I bought it thru enom). I’m just a little unsure of what to enter into the “host name” blank. @? www? @omsinsights I’m still getting up to speed on domain mapping. I will discuss with James for you and let you know what he says. it ALMOST worked…. now when i type in “mydomain.com” i get the edublogs sign-in page. how can i make it go to “omsinsights.edublogs.org” instead? i’m hoping people can type in “mydomain.com” and be sent to my blog. @omsinsights I’ve just sent you an email from Edublogs support showing you what it looks when mine was redirected so you can compare. I’m trying to sign up for Edublog Supporter and you certainly don’t make it easy! I keep on getting thrown back to the pages that explain what it is, rather than the form that shows me how to pay my money so I can become a supporter! @mrsbouchard Can you give us some more details of what is happening? I tested it on my computer and when I go to the Supporter Tab in my blog dashbaord and click on PayPal it takes me to the PayPal sign up page. Can you tell me what steps you have tried and what web browser you are using. I need to know if purchasing a domain name is somehting that I will have to renew each year or if once I purchase it I own it and it is mine for ever and ever without any more money to plunk down. @Mr Moshe All going well and you? Normally you purchase the domain from companies like GoDaddy. Once you have purchased it you own it unless you let it expire. Cost depends on which you purchase and whether you purchase several at the same time. For example, my .com was about $10 and you need to renew each year. I’m having the same issue that omsinsights had earlier. Could you provide some help, please? Thanks! @Professor Williams Do you still need assistance? thinkharderblog.com looks like it is already an existing domain with a blog on it. So, this is completely free? @diamondstar Yes if you are an Edublogs supporter you can redirect a domain but you will need to grab the domain from a company like GoDaddy. I became an Edublogs supporter so that I could transfer my domain name, but my domain name host needs a name server and not the three IP addresses provided on the domain mapping information page. Please help! I’m getting so frustrated, and I can’t find any way to directly contact anyone. @msforrest You sure your domain name host won’t allow A records or cNames? If not I will need to discuss with James on Monday. I’m sure. I even called. I have been using aplus.net for my domain name for the last few years. Had I not already paid for this year, I’d switch to godaddy to make this easier, but I’m kind of stuck here. Can you please advise on what I need to do? Thanks! Hi I think my issue is the same as msforrest above. I am http://donalomahony.edublogs.org/ and want to move it to http://www.elearningisland.ie. I have purchased the latter and when I go to the DNS management panel from my service-provider, it looks for the nameservers and not the IP addresses. @msforrest and Donal O’ Mahony sorry for the delays in responding. I thought I had chased this up with James but obviously hadn’t. 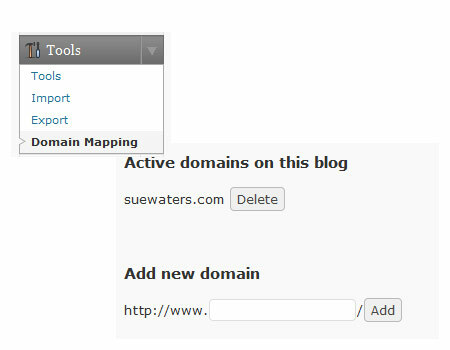 At the moment there isn’t the ability to use nameservers with domain mapping for Edublogs Supporter. Using ‘A record’ is your best option.